Our oldest turned 39!! We felt like Oprah… you get a pizza and you get a pizza and you get a pizza. Bryon introduced HIS kids to “The Last Starfighter” and we all dug into the pizza of our choice. Ice cream for dessert and the evening was a success. Cards and gifts were opened and wishes made. Father and son…a birthday filled with laughter, fun, mugging for the camera and making good memories. A quick trip though a fabric store (silver material) and a scrapbooking department (for two sheets of glitter paper) was all I needed for this terrifying costume. I already had the plastic nails (doesn’t everyone), and only needed to paint the nail part silver. What took the longest was drawing out lightening bolts and cutting them from the two glitter papers stuck together. I did all sizes of bolts. Two bolts were connected to a ring, which secured the cape. Small lightening bolts were taped onto an old bracelet. The hardest part was making the earrings, which I combined with crystals to add some extra sparkle. 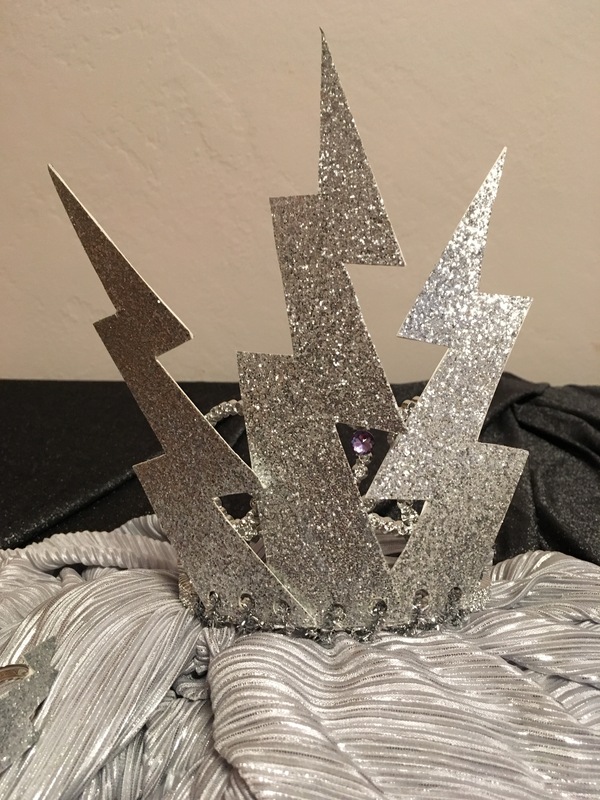 The crowning glory (pun intended) was three bolts punched and woven with a sparkle pipe cleaner around an old plastic tiara. We all have those lying around, right? I dressed in black and had a blast (there’s another pun for ya) at the party. Much has been written about the Women’s March on Washington, the day after inauguration. People wrote about it if they were there or not, supported it or not. My husband, my friend Susan, and I attended the Salem, Oregon march for as long as my health would allow. It was worth it. There was such a joyous feeling. Strange, since this march was partly born from a woman’s sadness on election day. To win the popular vote by so much then to lose through the electoral college….she felt helpless. So she decided to do something. She set up a facebook events page inviting people to march the day following inauguration. The LA Times said she went to bed with 40 people joining and when she woke up, there were 10,000. If there is ever a lesson on wondering if one person can make a difference, here’s a good example. This is the first sign I saw, and it struck me as a fitting way to begin the march. Love, not fear; bringing together, not pushing away. A sea of pink meant to me that we would stand up for those marginalized and insulted by our new president. We would stand together. I love this picture. (I did not take it. I tried to find the photographer for acknowledgement.) It was said to be taken at the Portland, Oregon march. I am proud to say that throughout the country, there were no arrests, no destruction of property, and no break-out riots. As I said before, for me it was joyous. There was such hope in the air. Women, men, children, and several doggies in attendance. The young and the old, united to say….we are together. We can make a difference together. We are united with those across the country, even the world, to say that fear and hate will not win. Not on our watch. Dreams and goals are a funny lot. They change or intensify as other things either move out of the way, take their place, or come true. I once had a dream to live on the coast. I didn’t have to live there forever….just one year. I wanted to see all the seasons, storms and all. My life changed and without regret, I put that dream in my back pocket. It’s years later, and I dusted off that dream and looked at it in a different way. What if hubs and I stayed 3 days and 2 nights at the coast each month for an entire year. That would do it! We took some time out of our ocean watching to pop in and out of the quirky little shops downtown. Unhurried, we were able to chat with some of the store owners. Being November, downtown looked like a ghost town. But hubs and I were content. Some of that had to do with his favorite pizza place, Tie-Dye Pizza, being open. In the middle of the night I crept to the curtains and peeked out. The tide was out and above, clouds had parted enough for me to gaze at the stars. On our last morning we saw patches of glorious blue sky. While this picture does not show it, what looks like a speck in the center of the photo is really a half moon. On our way home we saw that someone with time and a sense of humor had grown a smiley face on the side of a hill. From our view it looked a little like “The Grinch that Stole Christmas” but I am sure the intent was a smiley face. A lovely weekend. Goodbye ocean…..see you next month. My knee surgery was “out patient” in that I went home after I was awakened. Once I was open for company, my family came by with treats to cheer me. E7 drew the above picture. I appreciate the pink she put in my cheeks. I might also note that she got the perfect amount of gray in my hair. N10 and J8 came with roses, Trader Joe’s vanilla meringues, as well as jokes to keep me laughing. L9 drew two pictures which included a great deal of thought. The picture above is what NOT to do. This is a turtle taking its time from where it is now to “done being sick.” Don’t be like a turtle. The whole idea is that I was to be like a bunny or a fox (or even a bunny being chased by a fox) and get to the “done being” sick as soon as possible. All this support for Gma could not have happened if not for my two sons and my daughter-in-laws…each precious and supportive cheerleaders as I improve.